As our week-long exploration of the stories spun in the hearts of Skyrim players comes to a close, we bring you a tale of the end result of too much time spent in this virtual fantasy world, as told by reader BlamefulZulu. I sunk to my knees on the side of the river. Holding my hands to my face, I started to wonder why was I the one to be plagued by this awful curse. My entire life I have been haunted by visions, and odd occurrences that no one else seems to see. Once a man on a horse flew off into the sky. Walls of buildings would disappear completely. I tried to tell people of this and was arrested for my warnings. They told me I was losing my mind, and was to be executed. I welcomed the news. I was ready for my death to be rid of these visions. Then the dragon came and I learned that I am Dovahkiin, I am Dragonborn. With that revelation came hope. Maybe these visions were part of what I am. I sought out the Greybeards, but they didn't know what I was talking about. I decided to go to the Mages College in Winterhold to seek their help. One the way there I slew a wolf that attacked me. After I had killed it it continued to walk in place, even after I took its pelt. I reached the College but there is where the worst happened. After I slew the Dragon Priest Morokei, I took his mask, I thought the old magicks within it could aid in finding peace. I was wrong for when I put it on my face disappeared. I stare in the river and all I see is the back of my hood. The dark thought, the one I never would say out loud rose to the top of my mind and I spoke. "Of course ya are laddie!" said the mudcrab that had sneaked up on me. I screamed and hurled a fireball at the crab that stuck it on the back of its shell sending it flying a few feet from me. Out of the dead crab rose a man clad in purple and red. He had pupil-less eyes, but a rather fine beard. "Well that wasn't very nice." He spoke. "It's about time you came to terms with the gift I gave you. Ya kept me waitin'. I DONT LIKE WAITIN'. Do you have any yarn with ya?" "HA! That's one of my favorite questions mortal, Sheogorath is my name. I've been sending these little "glitches" to you so you will finely welcome what ya truly are. You're a madman lad! Embrace it!" "YES! I've given ya the gift of freedom. Do with it as you please! Eat nothing but cheese, fight a dragon in your underpants. Relieve yourself in the Skyforge! Anything is possible for you as long as you're mad"
I talked with the Daedric Prince for what seems like a lifetime. In that time he showed me that I am truly free in my madness. I filled every chest, drawer, and shelf in my house with brooms, and made Lydia carry three hundred pounds of cabbage, and never put it down. I am Anendel The Mad High Elf Mage and this is how I became free. The Skyrim stories don't end here! 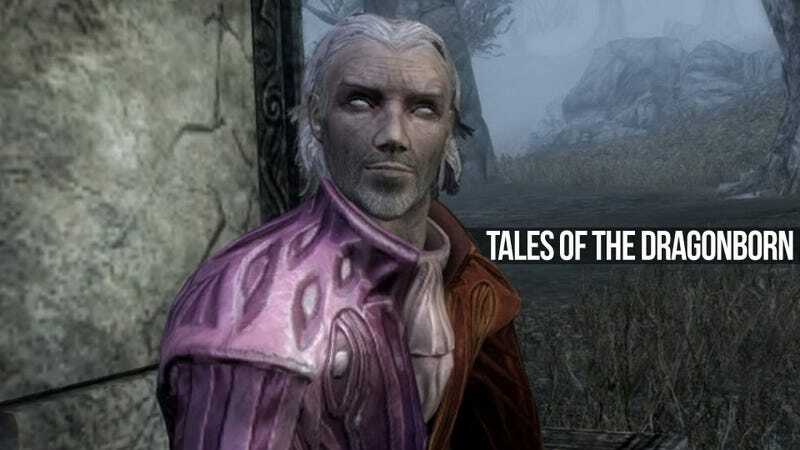 Visit the original True Tales of Skyrim Adventure post to witness the full legnth and bredth of our readers' imaginations!